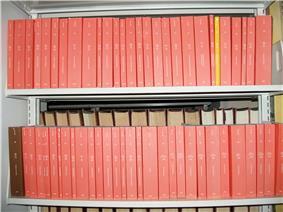 A few volumes of the CFR at a law library (titles 12–26). The Code of Federal Regulations (CFR) is the codification of the general and permanent rules and regulations (sometimes called administrative law) published in the Federal Register by the executive departments and agencies of the federal government of the United States. The CFR is divided into 50 titles that represent broad areas subject to federal regulation. The CFR annual edition is the codification of the general and permanent rules published by the Office of the Federal Register (part of the National Archives and Records Administration) and the Government Printing Office. In addition to this annual edition, the CFR is published in an unofficial format online on the Electronic CFR website, which is updated daily. Under the nondelegation doctrine, federal agencies are authorized to promulgate regulations (rulemaking) by "enabling legislation". The process of rulemaking is governed by the Administrative Procedure Act (APA): generally, the APA requires a process that includes publication of the proposed rules in a notice of proposed rulemaking (NPRM), a period for comments and participation in the decisionmaking, and adoption and publication of the final rule, via the Federal Register. The rules and regulations are first promulgated or published in the Federal Register. The CFR is structured into 50 subject matter titles. Agencies are assigned chapters within these titles. The titles are broken down into chapters, parts, sections and paragraphs. For example, 42 CFR 260.11(a)(1) would be read as "title 42, part 260, section 11, paragraph (a)(1)." The Office of the Federal Register also keeps an unofficial, online version of the CFR, the e-CFR, which is normally updated within two days after changes that have been published in the Federal Register become effective. The Parallel Table of Authorities and Rules lists rulemaking authority for regulations codified in the CFR. Code of Federal Regulations, seen at the Mid-Manhattan Library. Editions of Title 3, on the President, are kept on archive. Notice that for the first year of each new presidency, the volume is thicker. The Federal Register Act originally provided for a complete compilation of all existing regulations promulgated prior to the first publication of the Federal Register, but was amended in 1937 to provide a codification of all regulations every five years. The first edition of the CFR was published in 1938. Beginning in 1963 for some titles and for all titles in 1967, the Office of the Federal Register began publishing yearly revisions, and beginning in 1972 published revisions in staggered quarters. On March 11, 2014, Rep. Darrell Issa introduced the Federal Register Modernization Act (H.R. 4195; 113th Congress), a bill that would revise requirements for the filing of documents with the Office of the Federal Register for inclusion in the Federal Register and for the publication of the Code of Federal Regulations to reflect the changed publication requirement in which they would be available online but would not be required to be printed. The American Association of Law Libraries (AALL) strongly opposed the bill, arguing that the bill undermines citizens' right to be informed by making it more difficult for citizens to find their government's regulations. According to AALL, a survey they conducted "revealed that members of the public, librarians, researchers, students, attorneys, and small business owners continue to rely on the print" version of the Federal Register. AALL also argued that the lack of print versions of the Federal Register and CFR would mean the 15 percent of Americans who don't use the internet would lose their access to that material. The House voted on July 14, 2014 to pass the bill 386-0. ^ "Browse Code of Federal Regulations (Annual Edition)". FDsys - US Government Printing Office Federal Digital System. Retrieved 2014-05-23. ^ a b c "Federal Administrative Law". ^ "eCFR — Code of Federal Regulations". FDsys - US Government Printing Office Federal Digital System. 2014-05-21. Retrieved 2014-05-23. ^ "Electronic Code of Federal Regulations". ^ "About Code of Federal Regulations". ^ a b c "A Research Guide to the Federal Register and the Code of Federal Regulations". Law Librarians' Society of Washington, D.C. Retrieved March 10, 2014. ^ "H.R. 4195 - Summary". United States Congress. Retrieved 14 July 2014. ^ a b c "The Federal Register and Code of Federal Regulations". American Association of Law Libraries. Retrieved 14 July 2014. ^ Medici, Andy (15 July 2014). "House passes bills to change TSP default fund, extend whistleblower protections". Federal Times. Retrieved 21 July 2014. ^ "H.R. 4195 - All Actions". United States Congress. Retrieved 14 July 2014. "About Code of Federal Regulations". "A Research Guide to the Federal Register and the Code of Federal Regulations". Law Librarians' Society of Washington, D.C. July 21, 2012. "Report to Congress on the Costs and Benefits of Federal Regulations". "The Federal Register Tutorial / The Federal Register: What It Is and How to Use It".